Sweet jazz flavored heavy percussion Space Age set that may have been better positioned to create commercial impact while competing for market share against similar products geared toward folks buying "exotic" music in 1959 rather than 1961 when a more "light pop" sound was beginning to emerge on the scene. None-the-less this set is terrific sonic ear candy for any age. 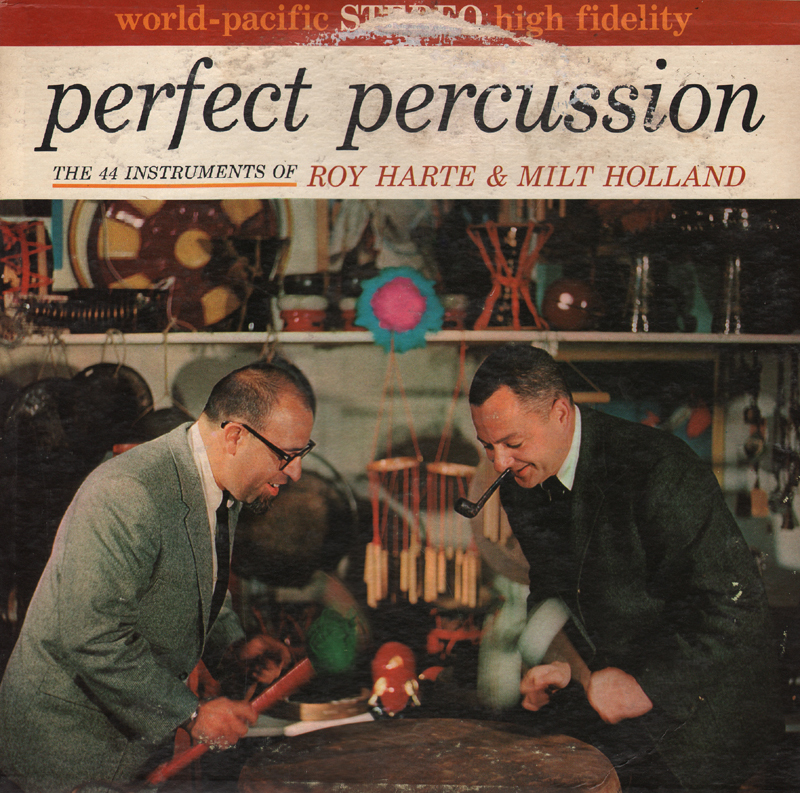 From Billboard - May 22, 1961: Those who love percussion have a rare package here. 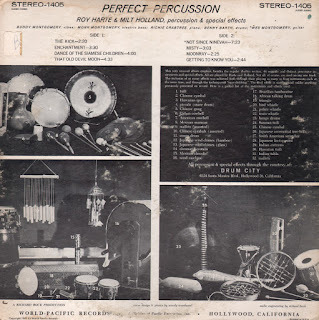 In addition to the usual rhythm section, 44 percussive instruments and special effects are used, including Chinese cymbal, Cuban cowbell, Mexican chocola, bird whistles, African talking drums and many others. These are played by Harte and Holland. Well recorded. In addition to being good stock for dealers, this package should prove of considerable interest to deejays. This set is currently provided by the rights holder on YouTube, so I will not be posting a sample. Check out Lonely People Do Foolish Things which is perhaps the most dynamic track on the set. The notes suggest that the producer worked to present Storm's talents in a creative way, particularly on the extended side one track which, I assume, was an impressive one take affair. None-the-less, I'm not sure the producer had a clear vision of how best to arrange music to frame Storm's sweet and smooth sounding vocal range or to produce the concept set which Storm's talent deserved. I can't guess why Vista produced this one color cover design which looks a bit budget. Below are a few bits of missing biographical information to add to the online sum of information found on Storm. 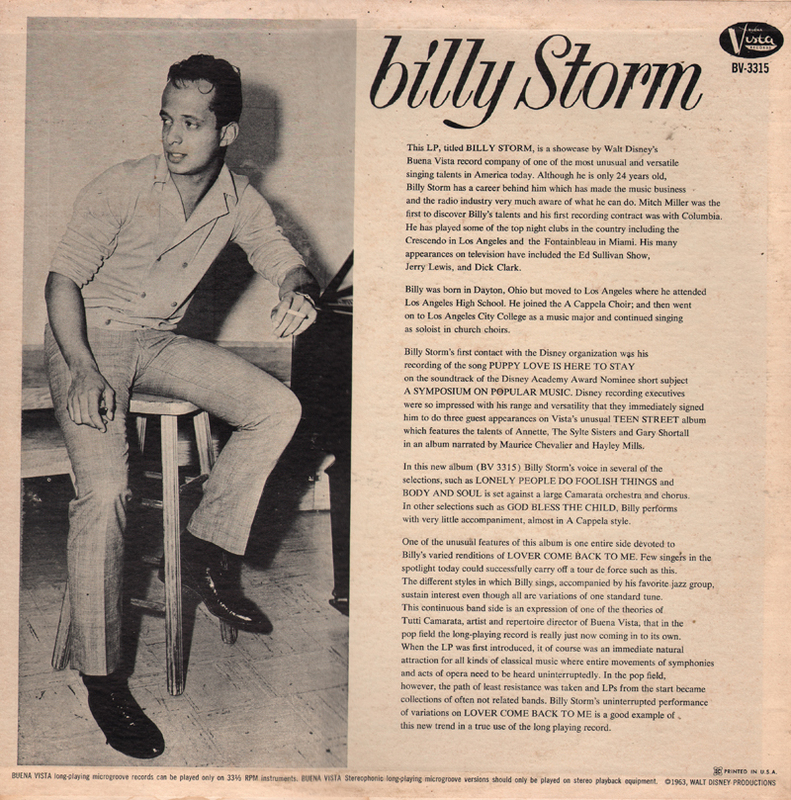 It appears that once Storm (William Spicer or Billy Fortune) disappeared from the music scene around 1969 that something may have happened as he completely disappears from the online history timeline. From the back cover: Billy was born in Dayton, Ohio but moved to Los Angeles where he attended Los Angeles High School. He joined the A Cappella Choir; and then went on to Los Angeles City College as a major and continued singing as soloist in church choirs. Billy Storm's first contact with the Disney organization was his recording of the song Puppy Love Is Here To Stay on the soundtrack of Disney Academy Award Nominee short subject A Symposium On Popular Music. Disney recording executives were so impressed with his range and versatility that they immediately signed him to do three guest appearances on Vista's unusual Teen Street album which features the talents of Annette. The Style Sisters and Gary Shortfall in an album narrated by Maurice Chevalier and Hayley Mills. 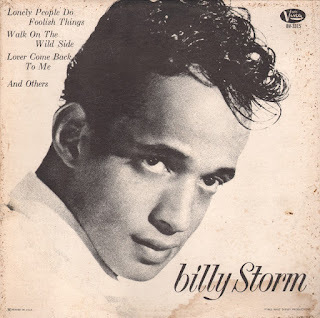 In this new album (BV-3314) Billy Storm's voice in several of the selections, such as Lonely People Do Foolish Things and Body And Soul is set against a large Camarata orchestra and chorus. In other selections such as God Bless The Child, Billy performs with very little accompaniment, almost in A Cappella style. One of the unusual features of this album is one entire side devoted to Billy's varied renditions of Lover Come Back To Me. Few singers in the spotlight today could successfully carry off a tour de force such as this. 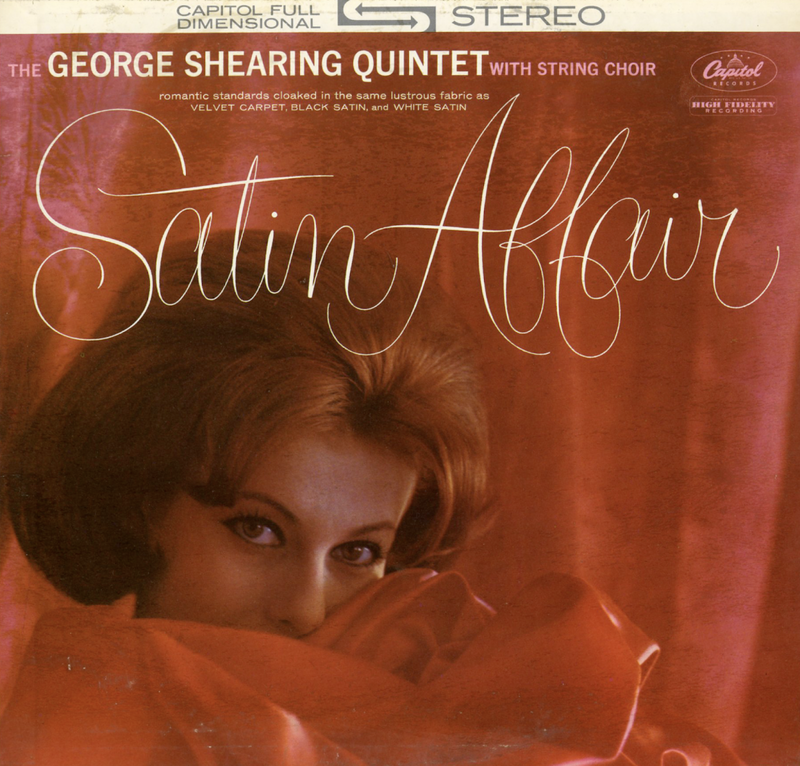 The different styles in which Billy sings, accompanied by his favorite jazz group, sustain interest even though all are variations of one standard tune. This continuous band side is an expression of one of the theories of Tutti Camarata, artist and repertoire director of Buena Vista, that in the pop field the long-playing record is really just now coming in to its own. A note found on discogs.com: Looks like an inofficial European reissue of a 1950s record with added tracks. 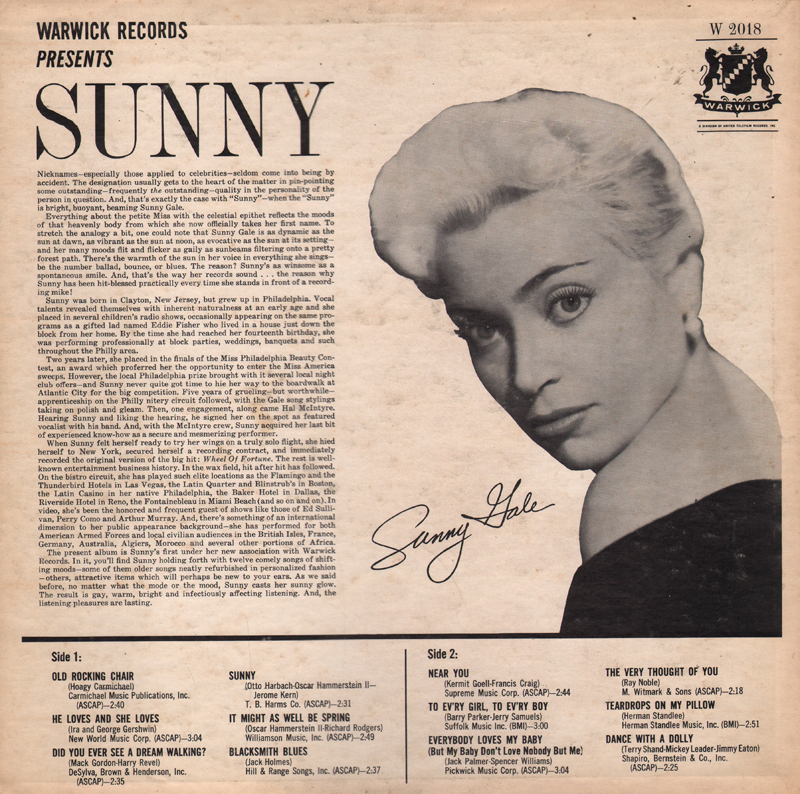 From the back cover: Sunny was born in Clayton, New Jersey, but grew up in Philadelphia. Vocal talents revealed themselves with inherent naturalness at an early age and she placed in several children's radio shows, occasionally appearing on the same programs as a gifted lad named Eddie Fisher who lived in a house just down the block from her home. By the time she had reached her fourteenth birthday, she was performing professionally at block parties, weddings, banquets and such throughout the Philly area. Two years later, she placed in the finals of the Miss Philadelphia Beauty Contest, an award which preferred her the opportunity to enter the Miss America sweeps. However, the local Philadelphia prize brought with it several local night club offers – and Sunny never quite got time to hie her way to the boardwalk at Atlantic City for the big competition. Five years of grueling – but worthwhile – apprenticeship on the Philly nitery circuit followed, with the Gale song Stylings taking on polish and gleam. Then, one engagement, along came Hal McIntyre. 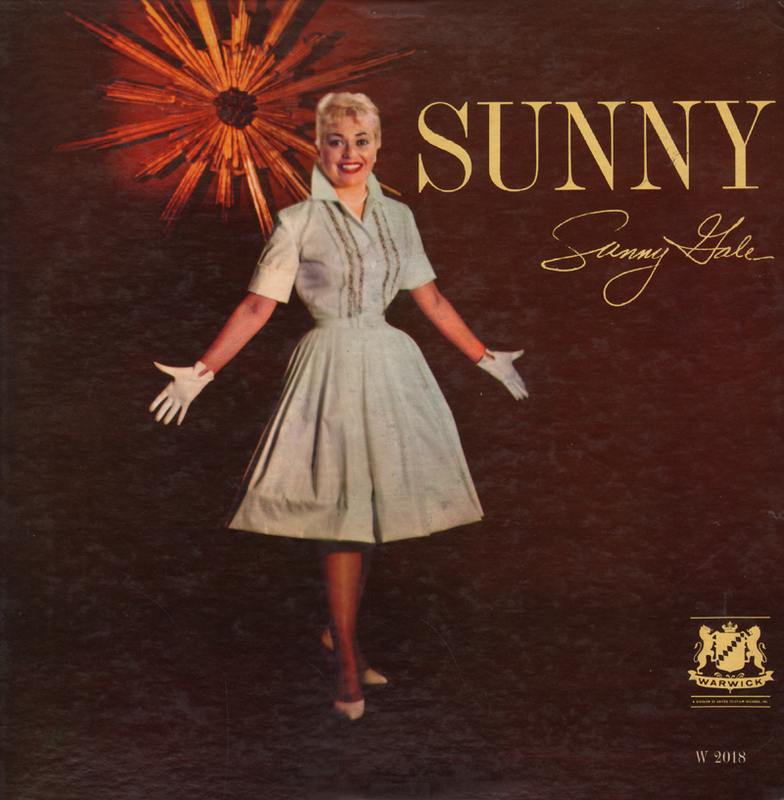 Hearing Sunny and liking the hearing, he signed her on the spot as featured vocalist with his band. And, with the McIntyre crew, Sunny acquired her last bit of experience know-how as secure and mesmerizing performer. When Sunny felt herself ready to try her wings on a truly solo flight, she hied herself to New York, secured herself a recording contract, and immediately recorded the original version of the big hit: Wheel Of Fortune. The rest is well-known entertainment business history. In the wax field, hit after hit has followed. On the bistro circuit, she has played such elite locations as the Flamingo and the Thunderbird Hotels in Las Vegas, the Latin Quarter and Blinstrub's in Boston, the Latin Casion in her native Philadelphia, the Baker Hotel in Dallas, the Riverside Hotel in Reno, the Fontainebleau in Miami Beach (and so on and on). In video, she's been the honored and frequent guest of shows like Ed Sullivan, Perry Como and Arthur Murray. And, there's something of an international dimension to her public appearance background – she has performed for both American Armed Forces and local civilian audiences in the British Isles, France, Germany, Australia, Algiers, Morocco and several other portions of Africa. The present album is Sunny's first under her new association with Warwick Records. 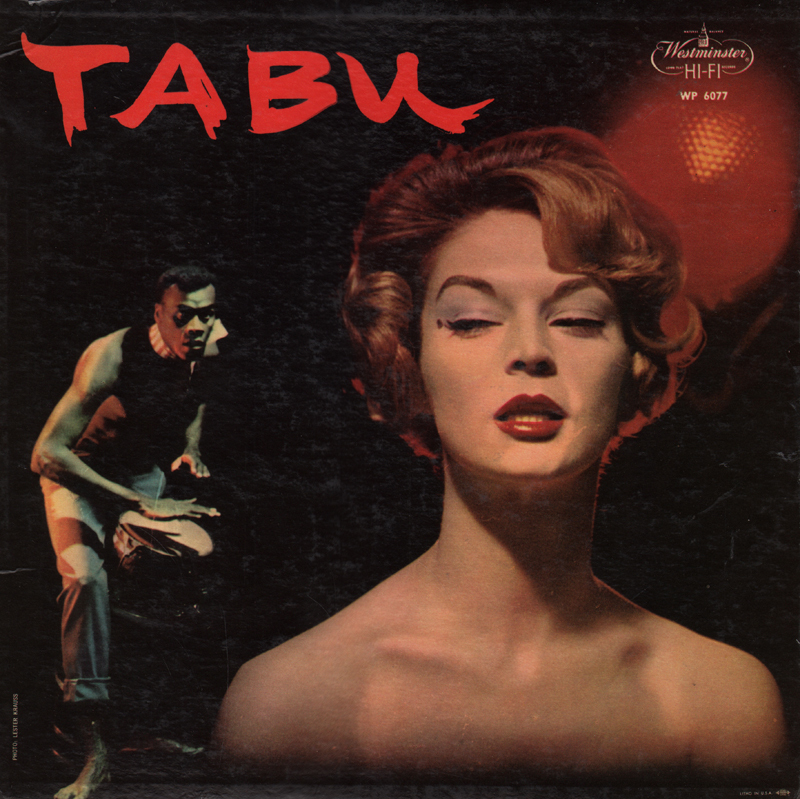 From the back cover: In Africa such dances (samba, rhumba, mambo) had been a part of religious rituals; in the Americas they have played an important role in those macabre ceremonies and incantations called voodoo – a mixture of religion, black magic, and sorcery in which simple natives, impelled by religious fanaticism and superstitious fears, seek to placate or to frighten off evil spirits with dancing, chanting, howling, and other more bloodthirsty rites. Many features of voodoo seem revolting or amusing to more civilized peoples, but the rhythmic power of the dancing exerts an irresistible attraction on even the most sophisticated. Thus these savage dances, toned down to fit our more moderate conception of ballroom dancing, turn up as the mambo, the cha-cha, or the merengue. The above paragraph sums up the project from the dramatic sensual cover photo by Lester Krauss, to the notes that promise "chanting and howling". However, the notes continue on to reveal that someone at Westminster decided that they had to tone down the set to a "more moderate conception". Never mind the disconnect between marketing department's approach and what Font actually recorded, this is still a vibrant and competitive 1958 Latin set that features Font's sharp, bright piano work. 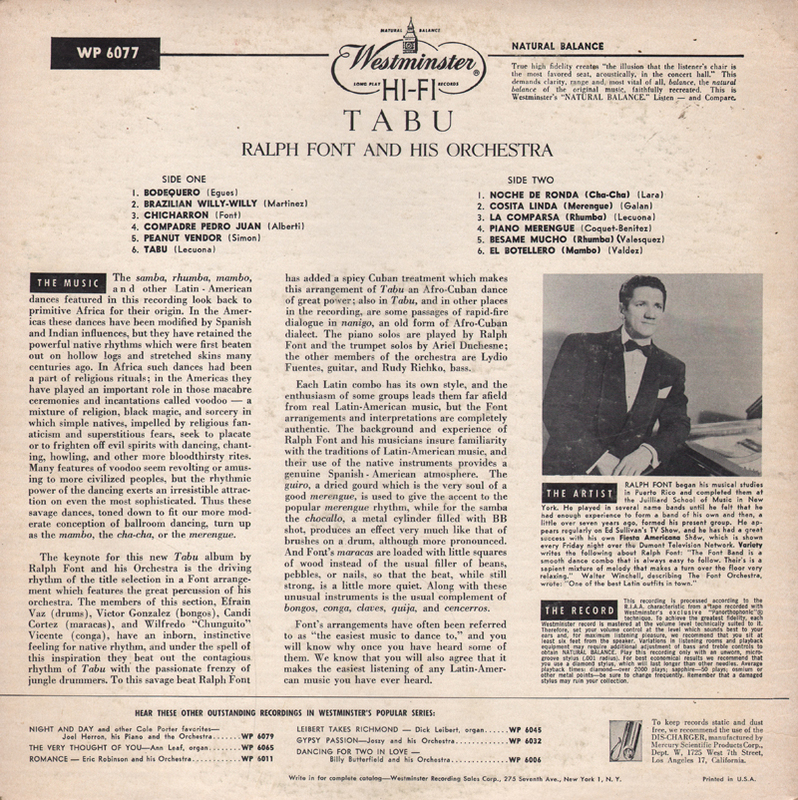 Also from the back cover: Ralph Font began his musical studies in Puerto Rico and completed them at the Juilliard School of Music in New York. He played in several name bands until he felt that he had enough experience to form a band of his own and then, a little over seven years ago, formed his present group. He appears regularly on Ed Sullivan's TV Show, and he has had a great success with his own Fiesta Americana Show, which is shown every Friday night over the Dumont Television Network. 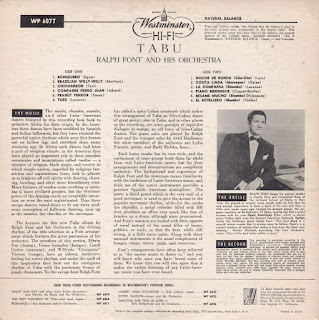 Variety writes the following about Ralph Font: "The Font Band is a smooth dance combo that is always easy to follow. Their's is a sapient mixture of melody that makes a turn over the floor very relaxing." 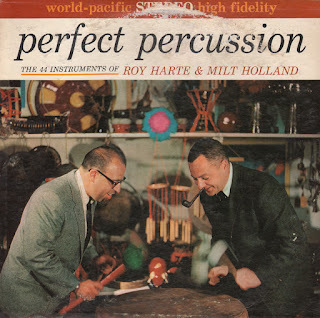 Walter Winchell, describing The Font Orchestra, wrote: "One of the best Latin outfits in town." From Billboard - October 9, 1961: Here's the familiar Shearing Quintet sound, with tasteful but sparing touches of strings woven in. 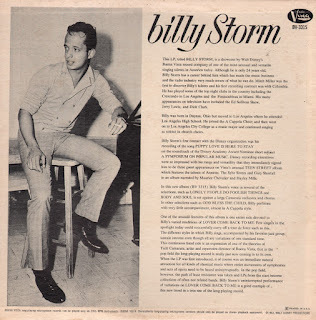 Billy May worked with Shearing on this scorings and a classy job they did on such tunes as "Early Autumn," "My Romance," "The Party's Over," etc. The set also boasts a most appealing cover. Good wax for late night romances and the jocks who serve that clique.